The nubbly crunch of toasted walnuts adds a new dimension to a classic crumble; pecans are equally good. This basic crumble topping can be used on all sorts of other fruits, from winter rhubarb, through to summer gooseberries or plums, to autumnal blackberries, pears or quince. Scatter the walnuts on a baking sheet and toast in an oven preheated to 180°C/Gas Mark 4 for 5-7 minutes, giving them a shake halfway through, until just beginning to colour and develop aroma. Leave to cool, then chop very roughly. To prepare the crumble, sift the flour and salt into a bowl (or food processor) Add the butter and rub in with your fingers (or pulse briefly in the processor) until the mixture resembles course crumbs. Stir in the sugar, oatmeal and ground almonds, if using. Squeeze a few handfuls of crumble in your fist to make lumps - I reckon it's nice to have a 'rocky' crumble than a fine, even-textured one. Put the apples in a large bowl, sprinkle over the sugar (you'll need to estimate the amount according to the tartness of the apples). Add the walnuts and the cinnamon, if using, and mix roughly. Spread in a pie dish or other ovenproof dish, getting the fruit as compact as you can. 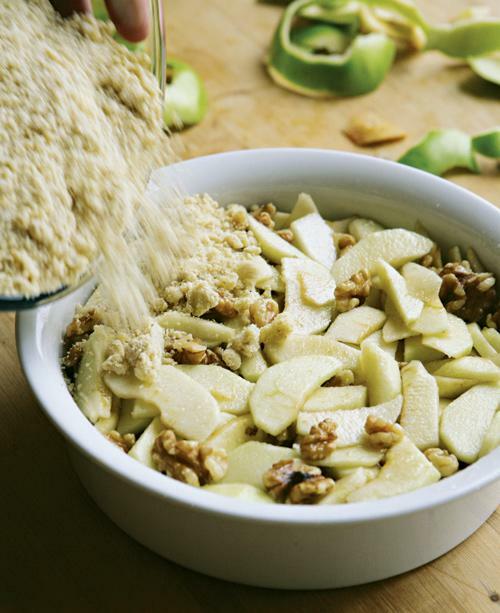 Scatter the crumble over the apples in a fairly even layer and bake for 40-45 minutes, until browned on top. Serve hot, with cream, custard or ice cream. eat leftovers cold for breakfast, with thick, rich yoghurt.